China panic has abated. The Shanghai Composite index of equities is back above 3,000. The much-feared devaluation never happened. The yuan has strengthened against the dollar this year, to the consternation of Western tourists. Outflows of money have slowed as dollar debt is paid off and Chinese investors wind down ‘carry trade’ positions. 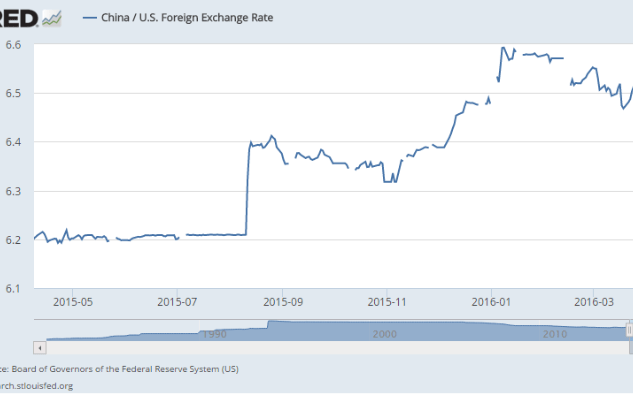 The central bank (PBOC) is no longer depleting the country’s $3.2 trillion foreign reserves to defend the exchange rate, and thereby tightening monetary policy as a nasty side-effect. China has the apparatus of an authoritarian state to curb capital flight, and is not shy about using it. The International Monetary Fund has just raised its forecast for Chinese growth this year to 6.5%, insisting that it is still far too early to talk about a hard-landing. Yet that is where the good news ends, for there is a poisonous sting in the tail. Maurice Obstfeld, the IMF’s chief economist, said the trade-off for this year’s growth spurt is even more trouble down the road. There you have the nub of the matter. Stripped of IMF circumlocutions, he is telling us that the Communist Party has once again let rip with debt-driven stimulus for the housing market and rust-bowl industries already chocking with overcapacity, stoking yet another mini-cycle to put off the day of reckoning. The likelihood that China will fail to grasp the nettle of reform in time to avert a structural crisis is rising from probable to almost certain. As the well-meaning premier Li Keqiang keeps warning his colleagues in the Standing Committee, the current course leads straight into the middle income trap. We can put away those charts projecting China’s ‘sorpasso’, the moment when the country surpasses the US to become the world’s biggest economy. 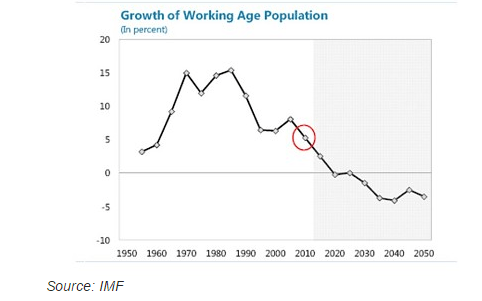 It is not going to happen in 2020, and will look even less likely in 2030, when China’s demographic dividend turns to deficit and the workforce goes into precipitous decline. “Implementation of a more ambitious and comprehensive policy agenda is urgently needed to stay ahead of rising financial sector vulnerabilities,” says the IMF in its Global Financial Stability Report just issued (4/13). The section on China reads like a horror story. The “credit overhang” has exploded to 25% of GDP, perpetuating a vicious circle of falling factory gate prices and plunging profits. 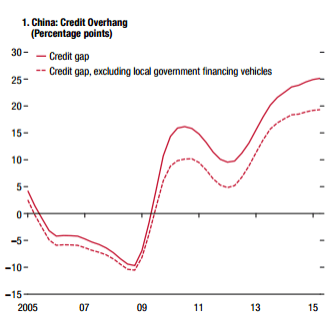 While the IMF does not use the term, China is basically in a ‘debt-deflation’ trap. Earnings have been dropping more quickly than nominal interest rates, automatically tightening the noose. “The ability of many Chinese listed firms to service their debt obligations is eroding,” it said. The ratio of gross debt to earnings (EBITDA) has doubled to four since 2010. Debt at risk – where earnings do not cover interest payments – has risen from 4% to 14% in five years. It has reached 39% for steel, 35% for mining and retail, and 18% for manufacturing and transport. The average payment to suppliers has been stretched to 72 days. “The broad and marked run-up in payables debt throughout supply chains strongly suggests widespread and rising corporate stress,” it said. Reported non-performing loans are 6% of GDP but not much is reported. The figure for loans “potentially at risk” has soared to 15.5% or $1.3 trillion. The IMF warned that losses could amount to $756 billion. In other words, not even China is immune from a financial crisis, even though the banking system is an arm of the Communist state. My own assumption has always been that China’s denouement would be a slide in stagnation, a slow virus à la Japonaise. This may be too sanguine. 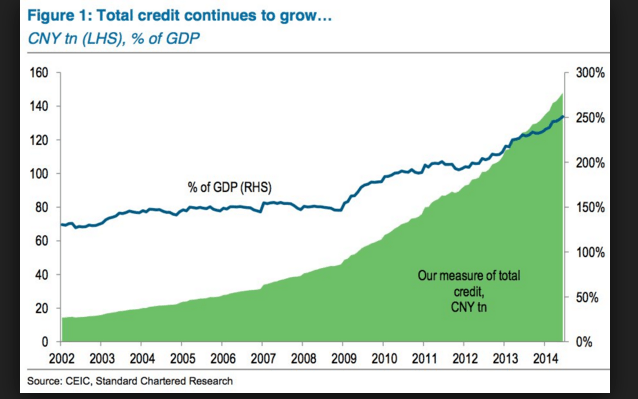 Debt in China is still growing faster than the economy. The government has had its foot on the pedal since last July, rattled by the unexpected recession of early 2015 (which it never admitted). This reached a crescendo with a 23% rise in lending to a record $650 billion in January and February. The Communist Party has been reaching for the bottle again. The total debt ratio has jumped by 10 percentage points of GDP in the last year to 260%. Most new credit is rolling over old debt, and the rest is subject to steeply diminishing returns as the economy nears debt exhaustion. Fitch Ratings says the efficiency of credit – the extra yuan of GDP growth generated by each extra yuan of debt – has collapsed by two-thirds to a ratio of 0.2 since the lending spree began in 2009. The risks are rising exponentially for little gain. Beijing is buying time in a Faustian Pact that grows more dangerous every month. President Xi Jinping vowed a “masterplan” of sweeping reforms at the Third Plenum in November 2013, unveiling a raft of measures to break the suffocating grip of the giant state-owned firms (SOEs). He pledged to end the tangle of price controls, establish an independent judiciary, and pave the way towards a free market economy where the state no longer meddles in the allocation of resources. This never happened. Instead the state authorities – in their infinite wisdom – deliberately inflated a stock bubble with margin debt. When it collapsed, they panicked, forcing companies and brokers to buy shares to prop up the market. The obsolete SOE’s are still gobbling up most credit while leaner private companies beg for crumbs. Party bosses are not willing to give up their SOE patronage machine, the tool of silent control. It was always wishful thinking to suppose that Xi Jinping could deliver a “free-market with Chinese characteristics” while maintaining the tight grip of Leninist party control over politics. The China Development Research Council – brain trust of the reformers – warned that this was impossible, telling him that the shift up development ladder to high-tech growth requires an open, free-thinking society, and an end to top-down rule. Xi had to choose between the two: he has picked Leninism. Andrew Colquhoun from Fitch says the state firms are tightening their hold over strategic industries and “backbone” sectors. “We believe that ‘market forces’ will play much less of a role than commentators have speculated, and that mass privatization is not likely,” he said. We are at an odd juncture. For months the narrative of erratic manic-depressive markets was that China faced meltdown, when in fact the worst of the last cycle was already over. Now the story is inverting again. Headlines are playing up a recovery that is patently unsustainable, driven by a sugar rush that must surely fade within a few months . 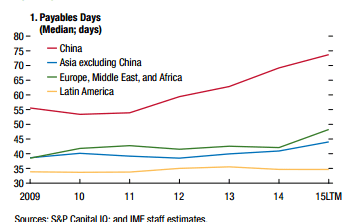 When that happens we will find out whether capital outflows from China are really under control. The IMF warns that the M2 money supply is an eye-watering 200% of GDP, or over $22 trillion (144,620 trillion CNY/6.47 to US$; China’s GDP is $10.35 trillion). If confidence buckles again, outflows of just a fraction of this money could easily swamp the reserve buffers and force a devaluation of such magnitude that it would break the back of the global trading system. My fear is that China’s latest stop-go cycle will roll over just as inflation rears its ugly head in the US and the Federal Reserve starts to tighten in earnest. That would be frightening. Storm protection for 2017 might be a wise precaution. — Ambrose Evans-Pritchard is the International Business Editor of the London Telegraph. This article originally appeared at To The Point News. NextIs Trump Really Working For Hillary?